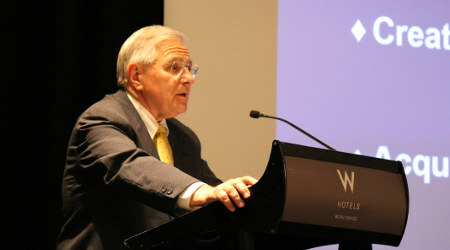 Ron Batory speaking at RailTrends in 2016. The U.S. Senate last night approved President Trump’s nomination of Ronald Batory as the administrator of the Federal Railroad Administration (FRA). The Senate also confirmed Raymond Martinez as administrator of the Federal Motor Carrier Safety Administration and Adam Sullivan as assistant secretary for governmental affairs, according to a statement from the FRA. Batory’s confirmation had been stalled for months by Senate Minority Leader Chuck Schumer (D-N.Y.) and other New York-area Democrats who were frustrated with what they believe to be the Trump administration’s lack of interest in helping to fund the rebuilding of Amtrak’s Hudson River rail tunnels. The Association of American Railroads (AAR) and American Short Line and Regional Railroad Association (ASLRRA) welcomed Batory’s confirmation as FRA leader. “Ron Batory is supremely qualified to guide the FRA moving forward, equipped with years of real world experience that will surely assist him in his oversight duties,” said AAR President and Chief Executive Officer Edward Hamberger in a prepared statement. Trump nominated Batory to serve as FRA administrator last year. While he awaited confirmation, Batory was named “rail adviser” to Transportation Secretary Elaine Chao. Batory has more than 45 years of rail industry experience and most recently served as president and chief operating officer of Conrail. Batory joined the company in 1998 as vice president-operations and was appointed COO in 2004. He retired from Conrail last year. Before that, he was president of the Belt Railway Co. of Chicago. Batory also spent more than 20 years working for both eastern and western Class Is, in addition to assisting a court-appointed trustee’s oversight of a regional railroad bankruptcy.